Posting late today because I spent the morning with a class of first graders at London's Tate Modern. The museum's vast and magnificently bleak entry hall frames your mind as does the nave of a great cathedral. 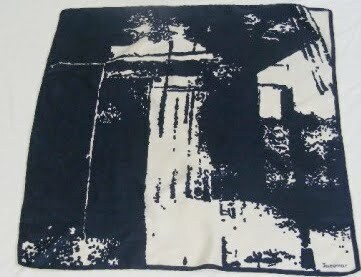 In that spirit, a scarf that I'm feeling especially well disposed to today. It's by Jacqmar (featured previously here). The subject is about as far from a grandma floral as it's possible to get--a brooding, modernist, vaguely sinister architectural print, evoking . 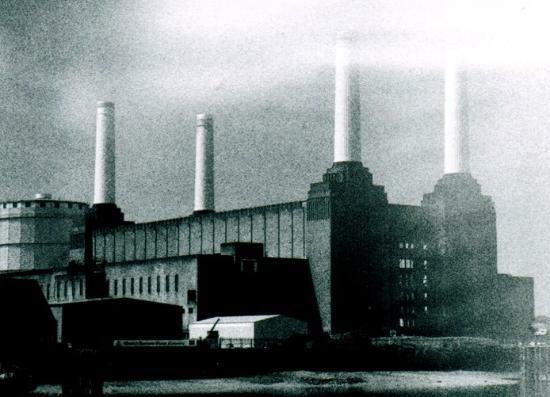 . . Battersea Power Station . . . the Wellington Arch . . . something staunchly resistant to the grind of time and the elements. What mad genius decided this would be appropriate around some lady's neck? I wouldn't be surprised to turn a corner and see it on a wall in the Tate . . .
STOP sending non-believers to buy Jacqmar specialist designs. They're all mine, mine, I tell you! Thanks, Elegance! Do you have a shop or great examples? Post a link pretty please!! Is that scarf? the photo is so blurred. Mad genius is right! It's beautiful.